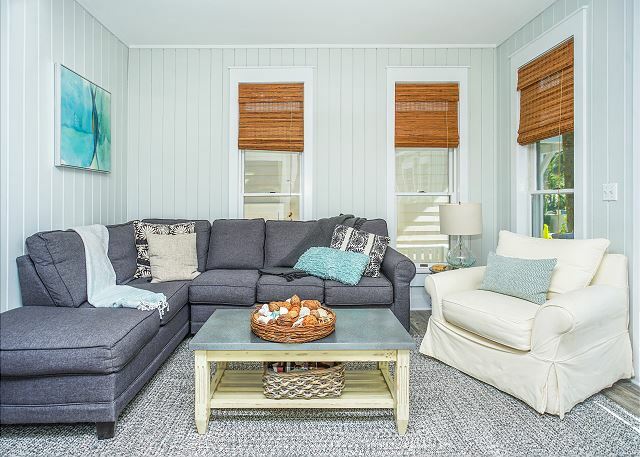 Welcome to Wave N’ Sea, our completely renovated 4 bedroom 3 bath home at the beach. 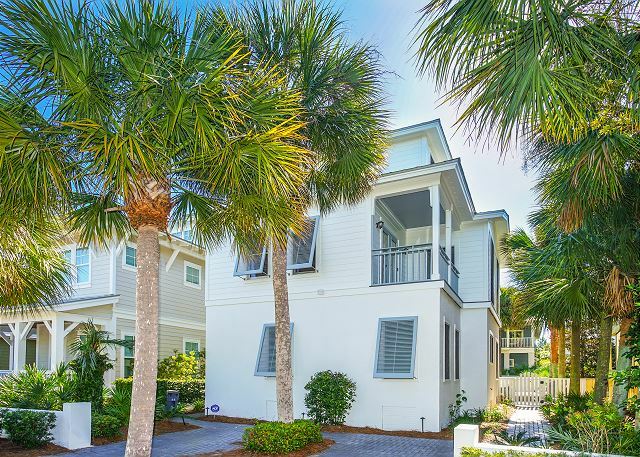 This spacious three story home offers elegant accommodations for twelve located just steps from the beach. And, it’s perfectly situated so that you can explore the many boutiques and one of a kind dining experiences in Rosemary Beach and Aly's Beach. After hours of fun exploring 30A or playing on the beach, you’ll be able to enjoy a dip in your own private pool! Pool is not heated!! 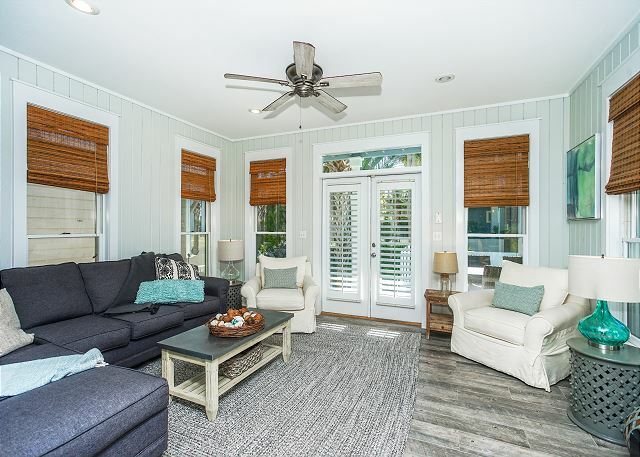 As you’ll see when you look through the photographs of this property the owners have done everything possible to make this the place where your family can create incredible beach memories. Inside and out. Outdoors is a masterpiece of vacation comforts from the private pool surrounded by cushioned loungers to the outdoor gas grill and the large outdoor table with plenty of seating to enjoy outdoor dining. Step inside and you’ll find a large living area with a 50” flat screen and seating for 9. 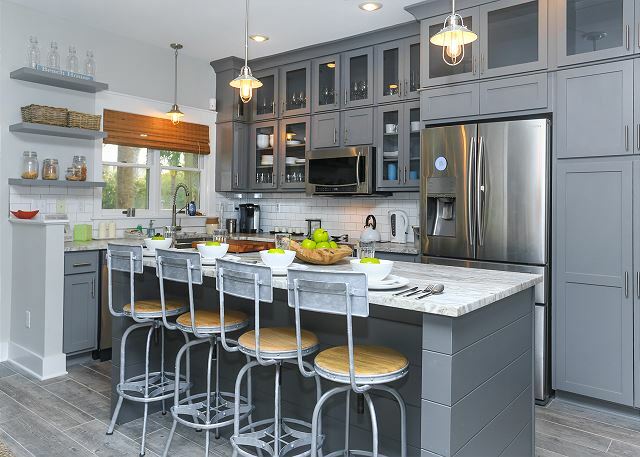 There’s a large dining table with room for six plus the granite kitchen island seats four more. The kitchen is roomy and well equipped so that you can enjoy freshly prepared seaside delicacies. There’s even a crock pot so that you can get things started and go play all day. You’ll find a large bedroom on the first floor with two double beds and its own private bath. 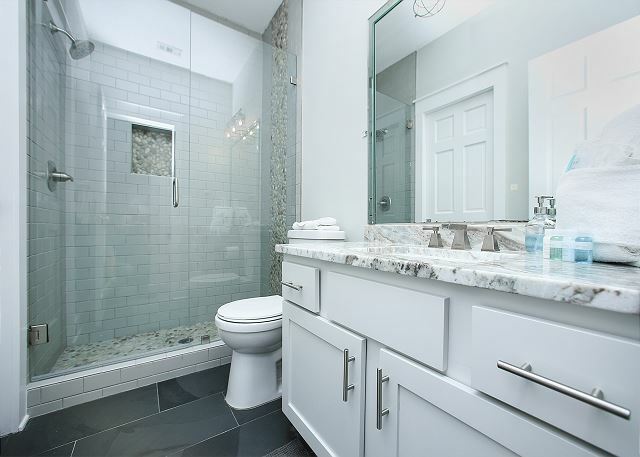 The shower incorporates a stone waterfall effect that is a truly unique treatment. There are two bedrooms on the 2nd floor. The main master has a King bed, a 43” flat screen TV and a private balcony with comfortable seating. 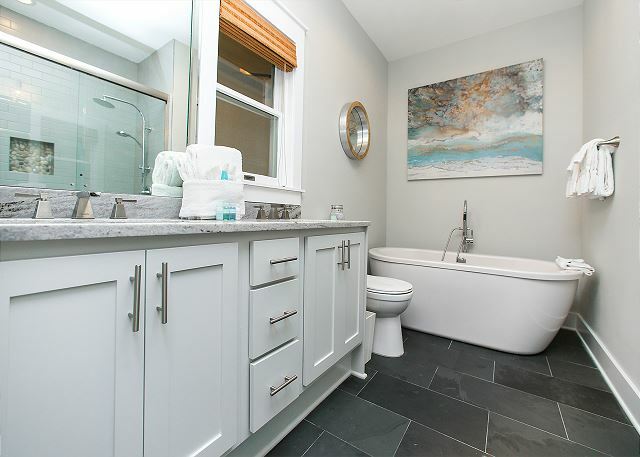 The main master bath has both a glass enclosed tile shower and a separate luxury tub. The 2nd master offers a queen, a large flat screen TV and access to the 2nd floor deck. 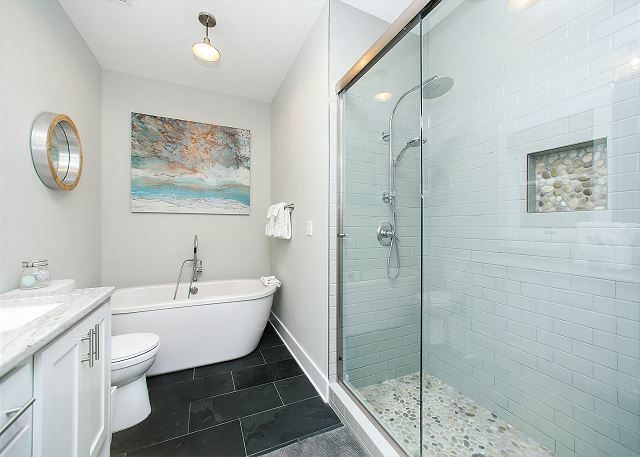 The 2nd master bath has a glass enclosed tile shower. Hidden behind the barn door in the hallway you’ll find the full-size washer and dryer. The perfect area to keep everything clean and fresh. 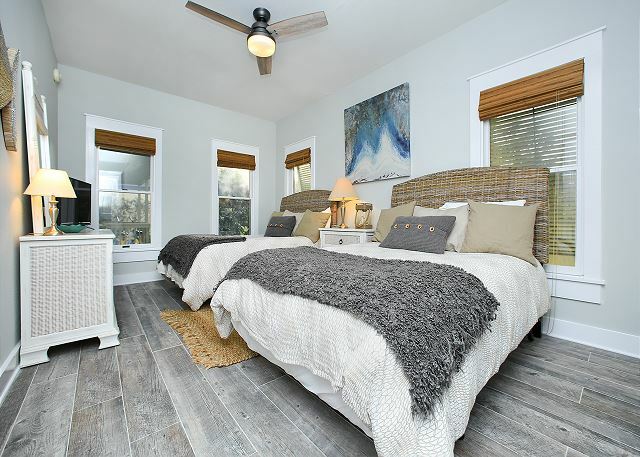 Up on the 3rd floor you’ll find a loft bedroom that’s perfect for up to four kids sleeping on two fold-out double beds and a large flat screen TV. The beds also offer underneath clothes storage. The loft opens out to a deck with cushioned seating for six or more and a gas-fueled fire pit to keep you warm when the evening breezes are a little cool. Everything about Wave N’ Sea is designed to create the perfect beach vacation for a family or two. The location is perfect. The home is perfect. And since you’re steps away from the world’s most beautiful beaches, you won’t find a more perfect vacation home.